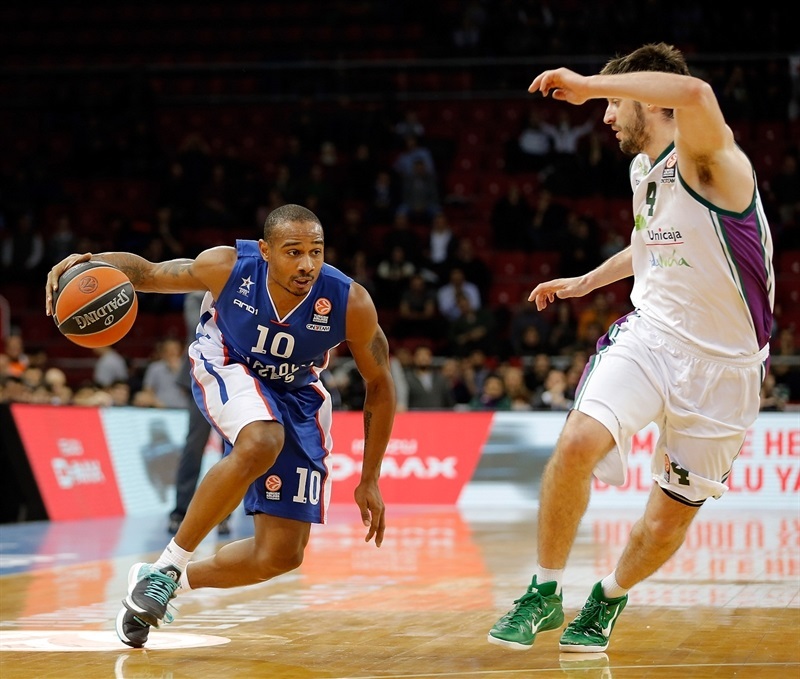 Anadolu Efes Istanbul rallied from a 15-point halftime deficit to down Unicaja Malaga 74-70 at home in Top 16 Group F on Friday. 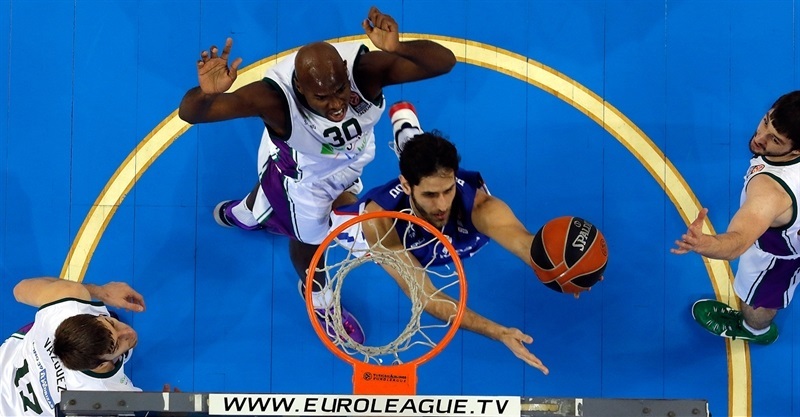 Efes improved to 2-0, while Unicaja dropped to 0-2. Matt Janning paced the winners with 17 points on 5-of-8 three-point shooting. Dontaye Draper was the game hero, scoring 5 of his 13 points in the final two minutes, including a game-sealing three-point shot. Stratos Perperoglou also added 13 points, while Cedi Osman had 12 for Efes. 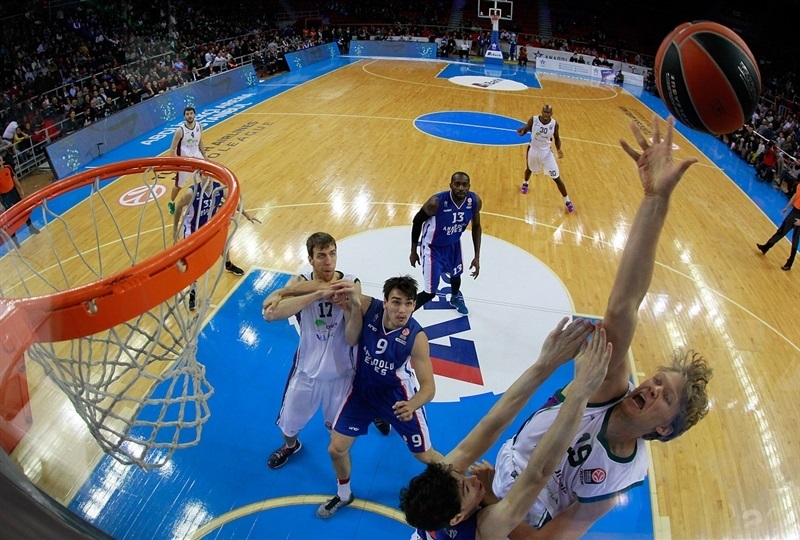 Vladimir Golubovic and Mindaugas Kuzminskas led Unicaja with 10 points apiece. Unicaja took off with an early 0-11 run and three-pointers by Carlos Suarez and Ryan Toolson allowed the guests to keep a 15-23 margin after 10 minutes. Golubovic and Will Thomas took over early in the second quarter to make it a 15-point game. Osman and Janning tried to change things for Efes, but a three-pointer by Stefan Markovic fixed the halftime score at 34-49. Janning, Draper and Perperoglou each struck twice from downtown in the third quarter to tie the game, 57-57, entering the fourth quarter. Osman gave Efes a 67-59 margin, but Jon Stefansson singlehandedly brought Unicaja within 67-66 with three minutes left. Osman scored again while Draper followed a driving basket with a critical three-pointer that sealed the outcome with a minute left. Matt Janning struck from downtown to get Efes going, as the hosts held Unicaja scoreless for almost two minutes. Mindaugas Kuzminskas scored around the basket and soon added free throws to put the guests ahead, 3-4. Kostas Vasileiadis sank a three-pointer and a close basket by Stefan Markovic caused Efes to call timeout at 3-9. Caleb Green dunked off a midcourt steal to cap a 0-11 run. Dontaye Draper stepped up with a step-back jumper to get Efes on the board. Stratos Perperoglou got the crowd involved with a driving layup, which Fran Vazquez erased with a jump hook for a 7-13 Unicaja lead. 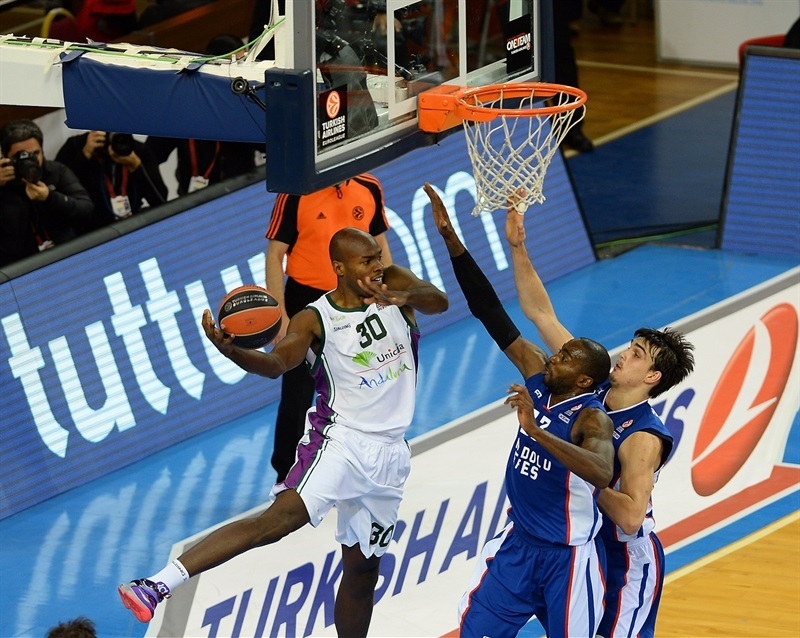 Stephane Lasme buried a mid-range jumper and a three-pointer by Janning brought Efes within 12-13. Carlos Suarez answered from beyond the arc and Ryan Toolson followed a three-pointer in transition with a fast break layup for a 9-point lead. A stop-and-pop jumper by Jayson Granger and a three-point play by Perperoglou fixed the score at 15-23 after 10 minutes. 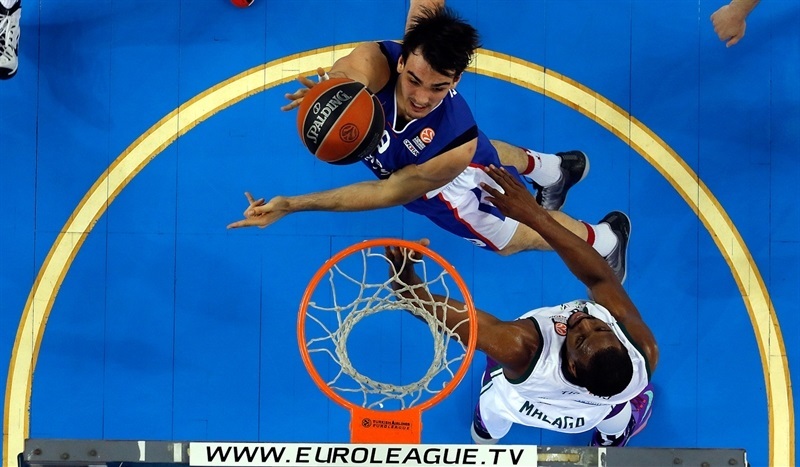 Perperoglou kept pushing Efes with a coast-to-coast layup early in the quarter. Granger beat the shot clock with a three-pointer, as the guests tried a different frontcourt with Vladimir Golubovic and Will Thomas together on court. Golubovic shined with a put-back basket and a dunk by Thomas capped a 0-7 run which made it a 13-point game. 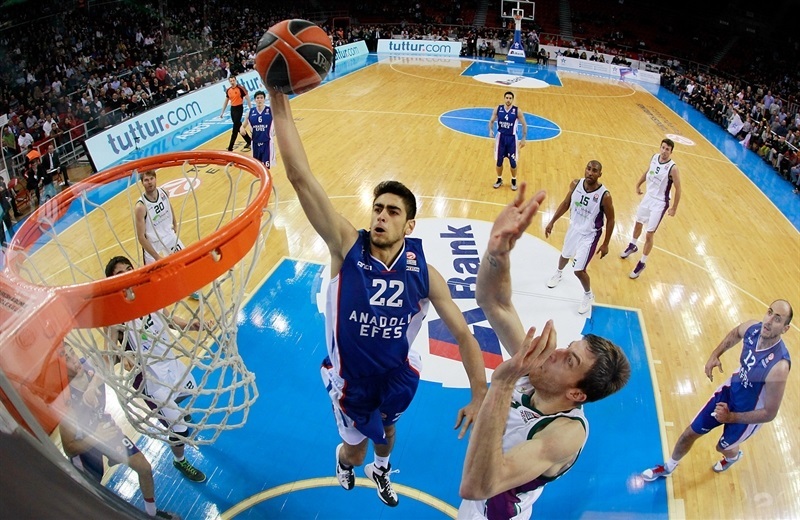 Milko Bjelica hit a three-pointer and Furkan Korkmaz copied him right after that to give Efes hope at 23-30. 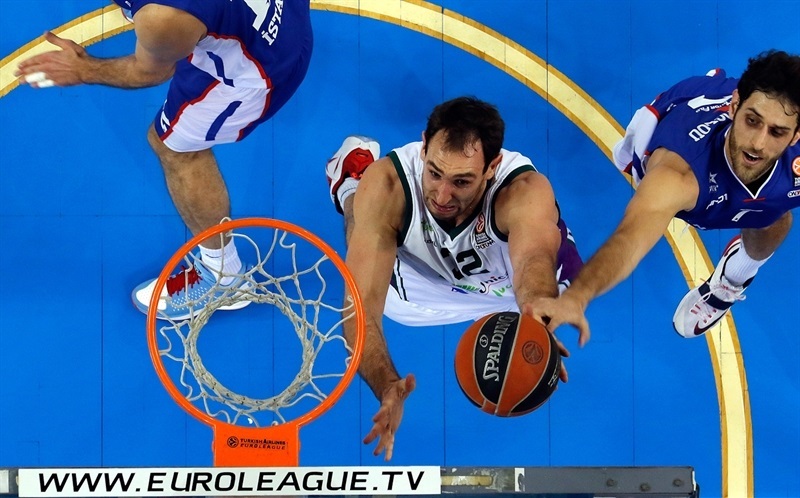 Golubovic scored again and a three-pointer by Thomas restored a 12-point Unicaja margin. Nenad Krstic stepped up with a put-back layup. Golubovic hit a jump hook and Toolson nailed a seven-meter bomb for a 25-40 score. Vazquez added foul shots, but Cedi Osman got Efes within 29-42. Kuzminskas dunked and matched Dario Saric's free throws with a layup. Janning and Markovic exchanged triples for a 34-49 score at halftime. 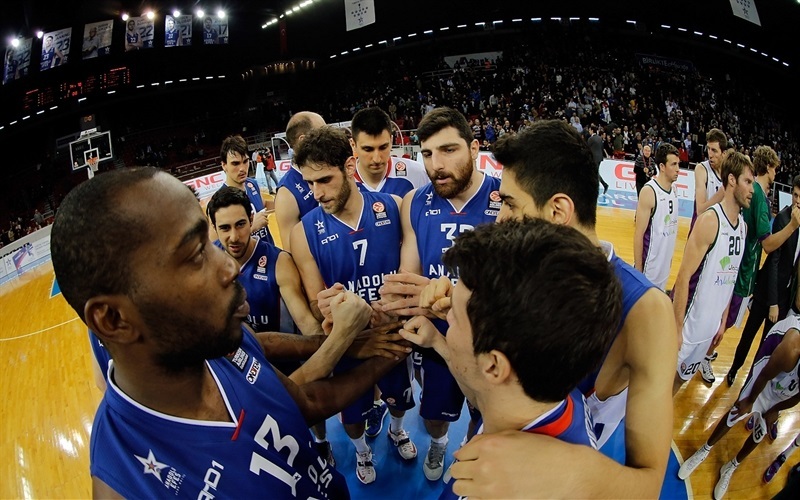 Janning fired in a three-pointer right after the break, as Efes improved its defense. Unicaja was held scoreless for more than two minutes, but a put-back layup by Suarez gave the guests a 37-51 edge. Janning shined with a big basket in penetration and a corner triple by Saric brought the hosts within 42-51. Thomas stepped up with a five-meter jumper, but Draper bettered it with a three-pointer from the top of the key and Perperoglou also struck from downtown to cause Unicaja to call timeout at 48-53. Perperoglou insisted with another blast from beyond the arc, as Efes kept excelling on defense and forcing Unicaja to take one off-balance shot after another. Golubovic drew a couple of fouls around the basket and split free throws for a 51-55 Unicaja advantage. Draper sank a three-pointer and Janning bettered Kuzminskas's foul shots with a bomb from downtown that tied the game, 57-57, at the end of the quarter. A dunk by Krstic completed the hosts' comeback, 59-57, early in the quarter. Osman took over with a driving layup, as Unicaja kept struggling to score. Head coach Joan Plaza tried a more dynamic backcourt with Granger, Stefansson and Toolson together on court. 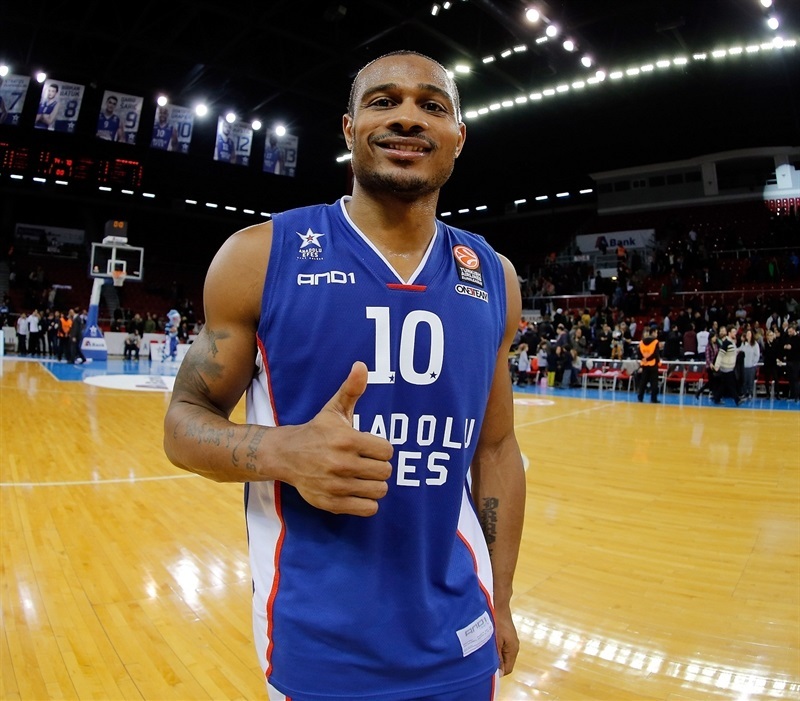 Osman scored again to cap a 10-0 Efes run. Golubovic tried to change things with a layup. 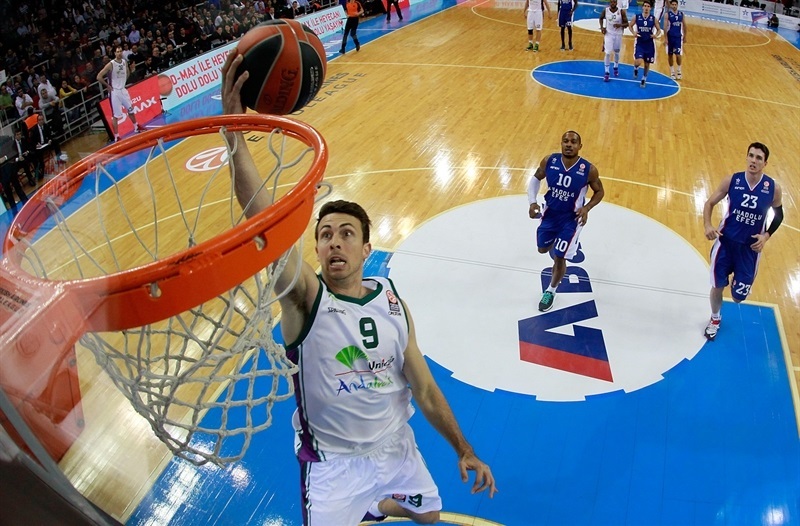 Korkmaz made free throws and a layup by Osman caused Unicaja to call timeout at 67-59. Stefansson hit a jumper and soon added a three-pointer to bring Unicaja back to life, 67-64, with over three minutes left. Stefansson swished a step-back jumper, but Saric fed Osman for a layup for a 69-66 Efes edge in the next-to-last minute. Vazquez shined with a jump hook, but Draper scored in penetration and bettered Thomas's layup with a big triple that made it 74-70, enough to seal the outcome in the final seconds. "This is a new team with a lot of young players. 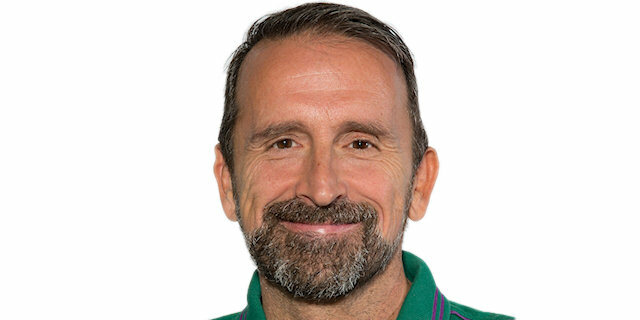 What I said to my players at halftime was that if we were a car, we had played in first and second speed and Unicaja had played in fourth, fifth and sixth speed. We had to show our character and start playing with more energy. We played a great second half and deserved to win." 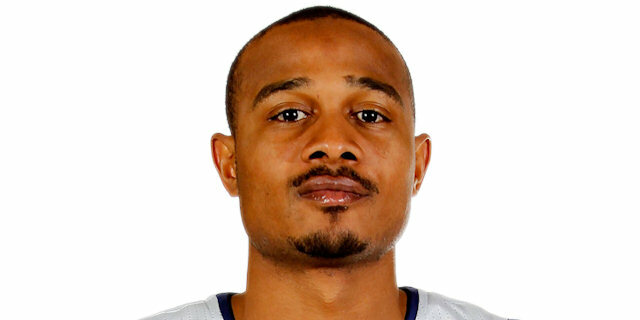 "We had a perfect second-half performance to beat Unicaja Malaga. It was a very interesting game tonight. In the first half, we couldn’t react to our opponent and failed to put our character on the court. Maybe we are the best defensive team in the Euroleague this season, but we didn’t show it for the whole first half. Unicaja Malaga did everything better than us, put energy on the court in the first half and played excellent. But in the second half we found ourselves, put character on the court and maybe played the best second half this season. 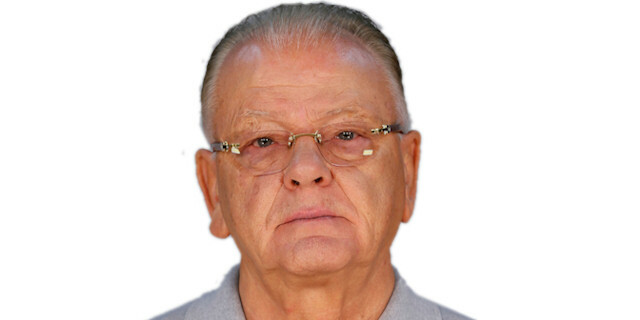 We kept Unicaja at 21 points. It seems like it’s really hard to come back after the first half. But my players put their hearts, courage and talent on the court. They really did a great job. We don’t have the luxury to play the same way we did in the first half in the other games." "This is what happens with our team. We are a hard-working team and Coach just tells us at halftime to do what we do best, which is defense, and defense, and defense - don't worry about offense, just play defense. We are still growing. We have two new players and Krstic is just coming back. We have to continue to get better as a team."